Winding down highway 601 coming from the quaint town of Ehrhardt, South Carolina you pass through open fields filled with crops and distant tree lines. Spanish moss hangs from the oaks and floats on the breeze as you turn into the grand entrance of Broxton Bridge Plantation. The G.D. 'Jerry' Varn family owns & operates the plantation. It was built in the late 1700s and has been in the Varn family for nine generations. Broxton Bridge Plantation offers a wide variety of hunting opportunities on over 7,000 acres of land---deer hunting, wild hog hunting, duck hunting over decoys, in addition to pheasants and bobwhite quail. There are plenty of options to choose from. We were there in search of some of South Carolinas most prolific creatures the 'Wild Hogs'. Just a few days before I made the call to Jerry and asked about making reservations. After a brief discussion about our needs he told me that Joetta would contact me and make sure that I was on the books. For good measure he gave me her phone number (843) 866-7285 and said that If I didn't hear from her in an hour or so to go ahead and give her a call. No sooner than you can shake a stick and wednesday afternoon was here, we were pulling into the plantation entrance and were greeted by Joetta Rizer and Mr. Rick Carter. They were both kind and first asked about our trip, then asked if we needed anything before we got ready for the hunt. They gave us a short briefing about the plantation and asked us how we wanted the afternoon hunt to go. We each signed the sign-in as we gathered our weapons of choice. Mine was the Remington 700 in 7mm with Leupold 6.5 x 20 scope. It's my deer rifle, but since we were looking for a 300 lb animal, I felt it was the right choice. that a well placed below the ear shot would anchor most any size wild hog. Joetta gave each of us our final direction and set off to put us in the stand. I was pleasantly surprised after not more than 45 minutes in the stand to see numerous wild hogs filtering out one by one into the field. Before long there were 40 or so, just like she said there would be. I used the Nikon to shoot and took some images. Watching them come out to feed on the well placed corn that was in the field. Before long I heard the loud crack of a rifle and a solid report that let me know one of the other hunters had chosen his animal. So far it has been a perfect afternoon! The hogs in the field spooked into the woods and left for the afternoon. What a great day! After the hunt Joetta came to pick us up and loaded the hog. It was a meat hog and weighed in at right about 80 lbs. PERFECT! A well placed .243 right under the ear and there was no wasted meat. We said good day to Joetta and Broxton Bridge Plantation and couldn't wait to get back there in the morning. She asked us to be there at 7:00 just as the sun was coming up over the horizon. The morning hunt included a short sit in the stand and then a stalk hunt. I was most interested in the stalk. Although while sitting in the stand I got to see three beautiful 8 point bucks and a handful of does walk almost underneath my stand. 8:30 came quickly and we were on the ground stomping around in search of hogs on foot. Three hunters and one rifle. We walked through the woods slowly, listening and looking ahead for any sign of movement. One of us would catch movement and warn the others of the presence of our prey. The rifleman would move into position and set up a good rest. Then we would let the group of hogs meander around until the perfect shot was given. The first two hours were spent stalking a 125 lb black sow. She was taken with one clean shot. The second stalk consisted of a better game plan and a better knowledge of the lay of the land. We set up the rifleman and gave him a specified shooting lane. Then we circled the group of hogs from the side and did a slow push towards the standing hunter. Before long the load crack of the rifle sounded and another fine hog was on the ground. Finally it was my turn to carry the rifle instead of my Nikon. With the help of my fellow successful hunters I was able to connect on a nice speckled sow that was dropped in her tracks at just over 50 yards. What an INCREDIBLE Morning! All of our hogs were taken back to the camp and weighed and prepared for photos. Joetta and her crew know how to take care of a group of hunters. She can talk the talk and walk the walk with the best of them. 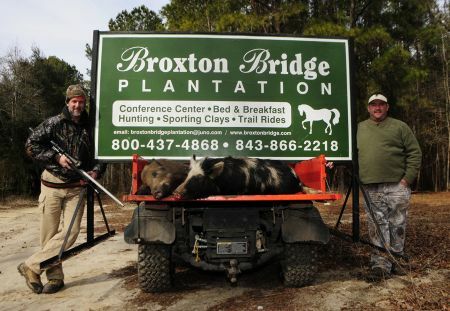 If you want to get out and stretch your trigger finger before turkey season then Broxton Bridge Plantation has a great option to consider � wild boar. Enjoy the excitement of a heart-pounding wild boar hunt in the South Carolina Lowcountry. Pick out a nice meat hog for the grill or a HUGE trophy hog for your wall. Either way call Joetta at 843-866-7285 You will have a blast for sure. Make sure that you do the stalk hunt!! It will get your heart pumping and make for a more memorable experience! assure that we will be back again soon! And don't forget!!! You can Hog Hunt in SC year round, so anytime you feel like you are getting cabin fever give her a call. If you go, be sure and tell Joetta that you read this post on the South Carolina Sportsman!